Here in this website about Rome, you will find facts, photos, travel tips, maps, travel guide, tourist information and much more about Rome. A city you can't miss! The work with the website started with a vacation trip in 2006. Me and my partner had a wonderfull holiday in Rome. I brought a simple digital camera and took a lot of pictures. Although I am not a photographer, just a happy amateur, I found that many of the pictures were ok. When I got home the thought about a webbsite was born but it took about a year before I started to work with it. At first my plan was to make a small website with a photogallery. But soon I came to the conclusion that there is so much more exciting to tell about Rome. The more I research the more fascinated i got. I starte with the sights and attractions that I had seen when I was in Rome and added more facts. Both more facts about the sights and attractions (history, background etc) as well as informaiton about opening hours, contavct information and also maps to show where in Rome you can find the different places of interest. My ambitions grew and with them the project. It is said that Rome was not built in a day. The same applies to this site. It is far fRome	finished. And it is a hobby project, so it takes time. I hope that you visitors will enjoy it and have indulgence with any errors. Do not hesitate to contact me with comments, your own tips, pictures or anything that you feel would improve the website. Mats - founder, not of Rome, but of this website about Rome. 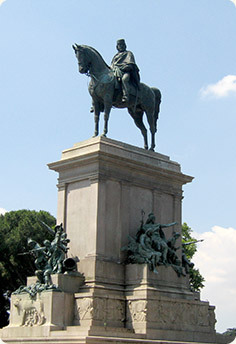 Garibaldi fought hard for a united Italy and tried on two occasions to take the city of Rome, but failed both times. In my Guide to Rome you find various information, for example, where you go shopping in Rome, restaurants in Rome a i Rome, What temperature it is in different monts and you can even learn some italian!